Tough one to write this one, because it’s effectively just a load of information to throw out there. Apologies for the text book style, just grit your teeth, read through, and work out what the labels mean in the world of Port. Ruby Ports are usually inexpensive, sweet, and simple. They’re full of colour and very fruity. Reserve Ruby Ports made from better parcels of grapes than normal Ruby Ports, they have richer fruit and are more settled due to cask maturation. White Ports are usually similar in stature and price to Ruby Ports, but obviously just made from white grapes. Can get nice honey and nut flavours. Crusted Ports are bottled young to keep hold of their sediment, so after a bit of time in the bottle they form a crust of deposit on the side. 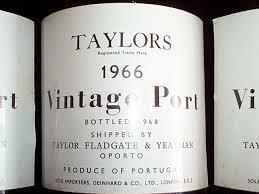 Late Bottled Vintage (LBV) Ports are Ruby Ports from a particular year that are oak aged for a while first. Modern LBV is good to go when bottled, and is the usual stuff you can buy. Bottle Matured LBV can get better in the bottle, but can be pretty punchy in price. Tawny Ports, or basic ones at least, are usually just like Ruby Ports but with less colour extracted. Sometimes they’re just Ruby Ports blended with a bit of White Port. Aged Tawny Ports are the real deal. These are Ports that have been barrel aged for years and years, sometimes over 40 years! Expect to have to pay up for the best. Colheita Ports are Aged Tawny Ports using grapes from a single vintage. Again, quite rare and knocking on the expensive side. Vintage Ports are Ports where blending and barrel ageing can’t do much to help it. They are great harvest years, barreled for a couple of years maybe, and then left to age in the bottle. This is the stuff that can be laid in cellars for a lifetime. Just keep these in your head before you go into pick yours up for the weekend. ← #NWTW Week 50: Pack Your Camera and Your Waterproofs!